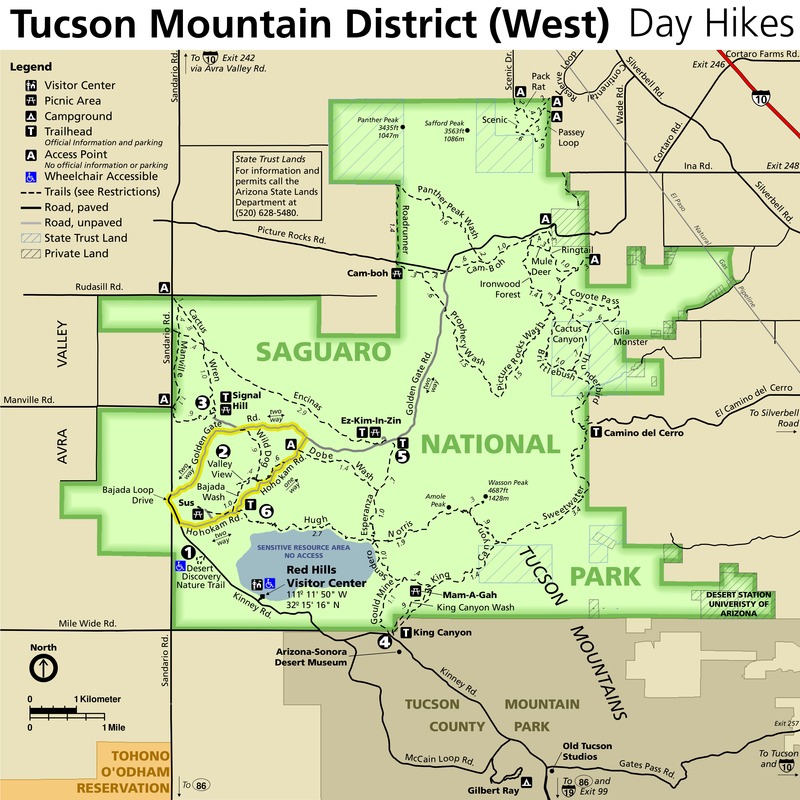 This hike is a loop in Saguaro National Park West that starts at the Signal Hill trailhead and comprises two trails, the Cactus Wren and Manville trails, around lots of mature saguaro and large palo verde, ironwood and mesquite trees. 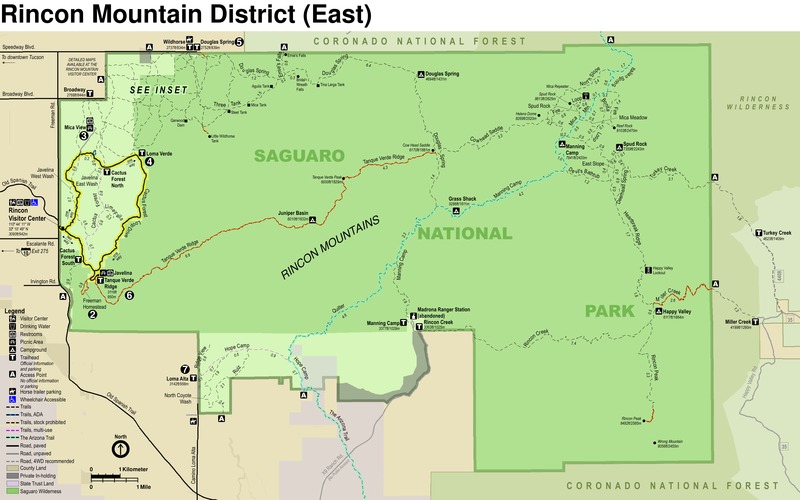 Breaks in the vegetation offer views of Apache Peak (3,076'), Wasson Peak (4,687'), Panther Peak (3,435') and Safford/Sombrero Peak (3,563'). This is a pretty easy trail with nice views and can be a nice quick jog as these trails aren't travelled much. While Signal Hill is widely visited, the loop around it is not. You won't be far from civilization, however, as the Manville Trail is just off of Sandario Road. Head up the trail less than ¼ mile to the junction where the two trails meet. 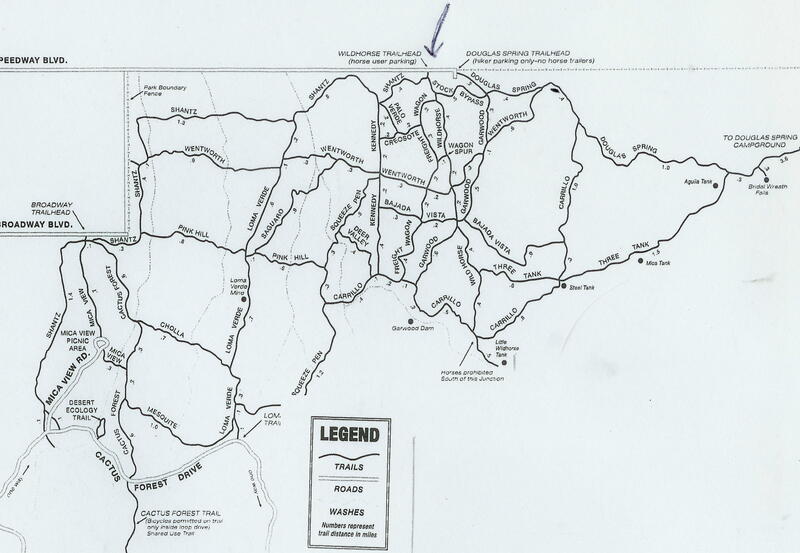 Traveling clockwise, take the Manville Trail west. After nearly a mile, the trail curves north and parallels Sandario Road. 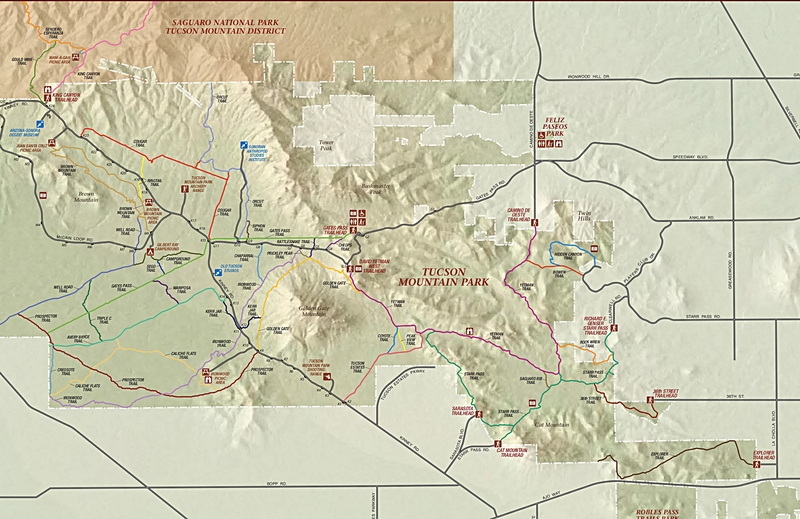 There are a couple of places where the trail heads left, that can be used to reach the road; the second one is where the Encinas Trail cuts across the trail and through this loop (the Encinas Trail runs from Sandario Road, across Manville and Cactus Wren trails, and ends just over 3 miles later at the Ez-Kim-In-Zin trailhead, picnic area and parking lot. 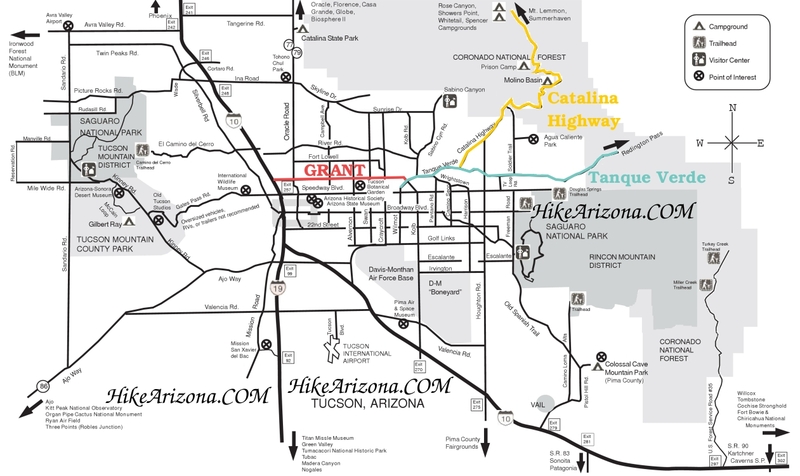 After traveling north about 1½ miles, the Manville Trail ends and the Cactus Wren Trail begins. Taking a left here will lead in 0.1 mile to the junction of Sandario and Rudasill Roads, so head right to stay on the loop. 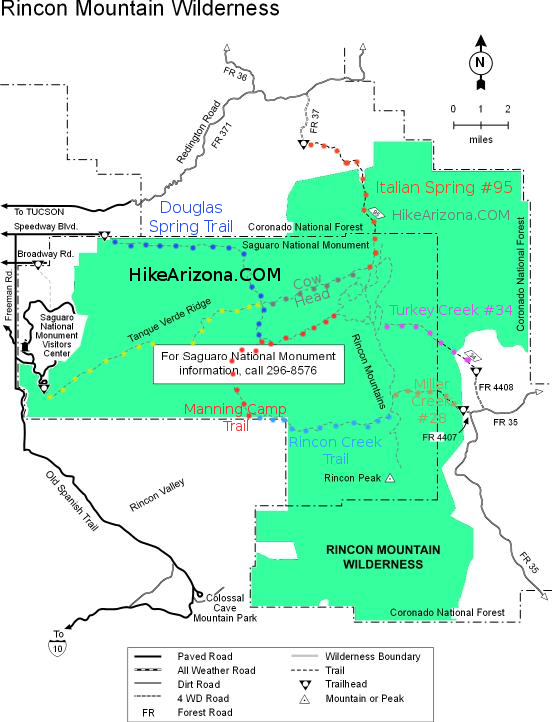 The Cactus Wren trail also is fairly flat and crosses several washes. After about ¾ mile the trail meets the Encinas Trail again; continue going south for another mile and the trail is back at Signal Hill. Just before arriving at Signal Hill there is a wash crossing; it is not marked well but it is fairly intuitive to figure out how to cross and regain trail. Before leaving, be sure to check out the petroglyphs off of Signal Hill. Definitely worth a look. There is a separate hike description on this website for Signal Hill for those solely going to see Signal Hill and not do the loop. From Sandario Road, turn east onto dirt Golden Gate Road. Follow this road less than a couple of miles to your left turnoff into Signal Hill picnic area.